The chapter introduces my ethnographic and sociolinguistic work and shows that the study may well facilitate an understanding of cultural minorities in Europe, and of the delicate interplay that occurs in their lives between language and ethnic and/or religious identification. This chapter moreover clarifies my methodological choices. I have chosen a qualitative approach anchored in the method of participant observation to be able to grasp more fully a wide spectrum of identity conceptions among my subjects. 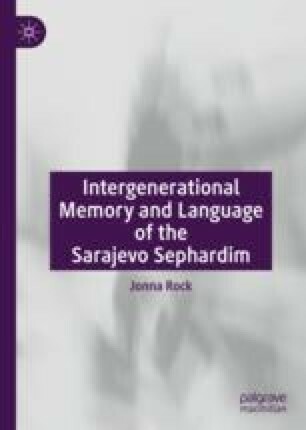 The core of the book thus consists of my empirical findings from interviews with Sephardim in Sarajevo. I combine these empirical findings with the theoretic framework developed in Chap. 2.